Van Gogh lived from 1853 to 1890. At that time nobody appreciated him as an artist. He is now among the top world-famous artists. His works are on show all around the world. To this day many people are inspired by his paintings, drawings and letters. What is unusual is that in addition to his paintings and drawings, the locations he lived and worked in can still be admired. From the Netherlands to the South of France. 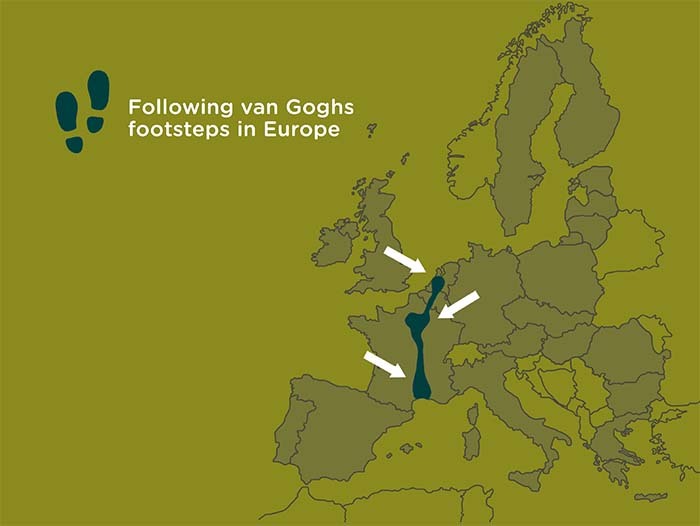 Various museums, cultural institutions, towns and organisations from the Netherlands, Belgium and France took the initiative at the beginning of 2012 to inaugurate Van Gogh Europe. After an intensive period of introduction the time has come to build on the foundations of the organisation.